No matter what you’re getting up to at night, you’re probably going to be hungry afterwards -- and living in New York means you shouldn’t have to limit the scope of your dining desires any more at 2am than you do at 2pm. 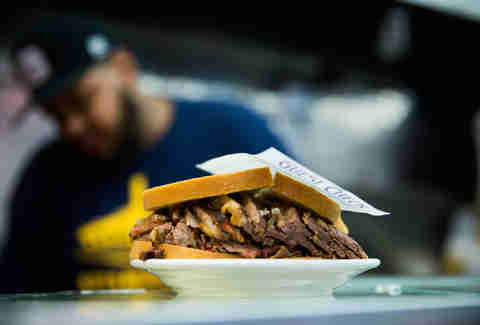 Whether you’re in the mood for one of the city's best burgers or want to get the most important meal of the day a little bit earlier, consult this definitive guide to the best late-night eats available 'til 2am or later in NYC, broken down by type of food. One of the only places in NYC where you can get the Jersey breakfast staple: Taylor ham, egg, and cheese. Few things will do as good of a job soaking up whatever else you’ve consumed that night. This Washington Square Park-adjacent spot has a huge selection of bagels and cream cheeses (including bacon & cheddar), plus a very solid -- and large -- bacon, egg & cheese. 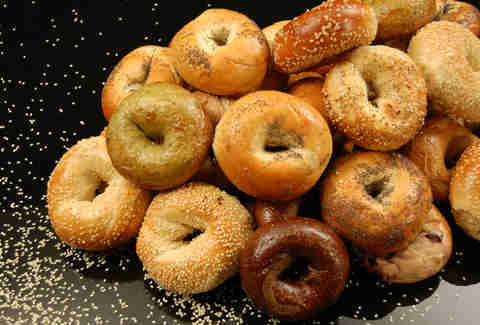 It’s not the original (the loss of which we’re still mourning to this day), but this distant relative across town has bagels that are basically just as perfect (and they’re available 24/7). Midnight brunch starts at 11pm, so it’ll be running smoothly by the time you get there. The griddle special will embrace you with a choice of pancakes, meat, and eggs. You won’t need to remember what you learned in eighth-grade French to eat at this 24-hour spot offering croque-madames and steak frites -- or the slightly less French-sounding croissant sandwich and fresh-fruit pancakes. It’s arguably THE diner of the East Village, with old-school flair and older-school prices. Get the pierogies. Neon signs, 24-hour service, and eggs served in skillets. The whole menu at this 24-hour Cuban diner is delicious (who doesn’t want huevos rancheros after a long night?!). For the sweet tooth in your group, the blue corn pancakes will be a showstopper. While the gnudi is a big hit, after midnight all we can think about is the burger -- one of the best in the city any time of day. The place sells over 75,000 of these per year. 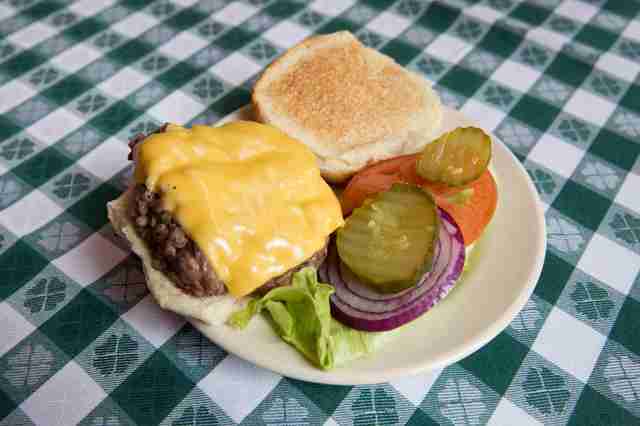 The burger at this classic UES joint is simple and juicy. It matches the restaurant’s old-school decor and doesn’t require any fancy aioli. 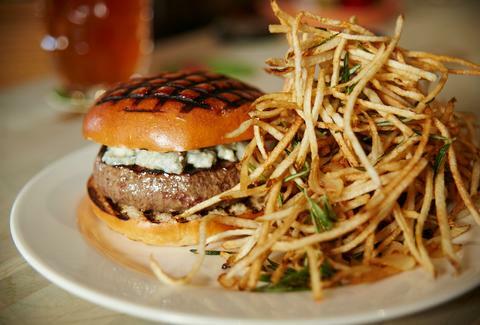 Another one of NYC’s best of the best, the Bistro burger at this West Village institution is a flame-broiled behemoth and clocks in at under $10. If you’re not feeling a bistro-style burger late at night, Harlem Shake serves a thin double patty. Go for the barbecue onion burger or the Hot Mess -- a classic burger with pickled cherry pepper bacon relish and smoky chipotle mayo. Another classic NYC burger spot, P.J. Clarke’s on the UWS serves up its famed Cadillac (with double-smoked country bacon and American cheese) until 4am every day. One of New York’s best double-patty burgers (made with grass-fed beef, melty American, chopped onions, lettuce, and tomato) can be yours after a late night out in Park Slope. A bar in its own right, Butter & Scotch will gladly serve you a milkshaked White Russian called an El Duderino, if your night isn’t over yet (or, if it is, just a regular milkshake). To close off the night, opt for the seasonal fruit pie a la mode. 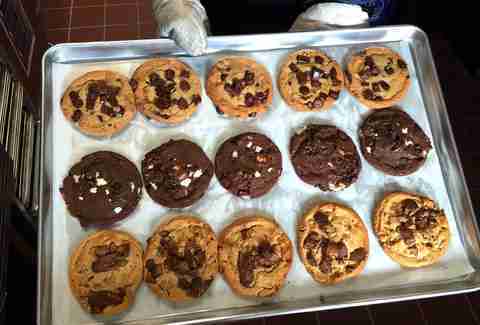 Warm, gooey cookies are always great, but they’re something truly magical after a night out. Get the double-chocolate mint. This mom-and-pop Chelsea joint has some of NYC's best donuts, 24/7. The move here is the honey dipped (traditional glazed). You’ll have to come back a little earlier next time for the Winner, Winner, Chicken Dinner but you can wet your beak with the late-night menu’s chicken & egg biscuit, jerk wings, and chicken tender basket. Rally the squad together and order The Bird and all of the sandwiches. There isn’t a bad one. 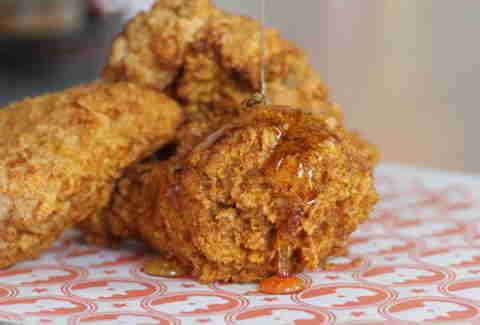 It’s hard to go wrong here with eight ways to dress up buttermilk fried chicken -- six stomach-calming biscuit sandwiches and two salads (for the health-conscious fried chicken eater amongst you). Keep it chill with honey chicken & pickles or grab a chicken, bacon, egg & cheese if you don’t need to be able to move for a while. Who doesn’t want spiced chicken on a biscuit at 4am? With the option of spicy or soy garlic, the major-league choice here is to go half & half and always wings. Do you ever get the feeling that you need a deep-fried hot dog with bacon, pineapples, scallions, and teriyaki sauce in your life? This is the solution. There’s not as many of these around anymore, but the Gray’s Papayas left are not messing around. A recession meal = two hot dogs and a drink. 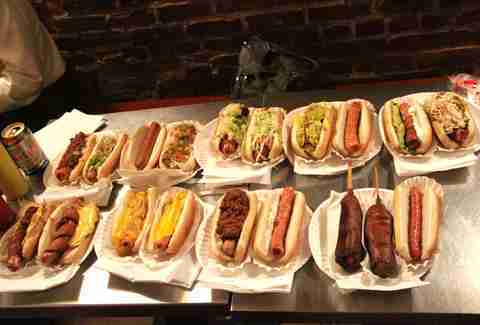 At this West Coast transplant, choose from 20 options of bangers, from boar to duck to multiple vegan options. And if you’re still thirsty, pick from the vast beer menu. It’s a New York institution, and while you’re obviously getting a hot dog (or several...), your biggest regret the next morning would be not ordering bacon cheese fries as well. In the historical landmark that was considered the original Ray’s Pizza, Prince Street Pizza parlays a late-night square that’ll bring you new appreciation for the shape. For a decadent and flavorful option, get the Spicy Spring with fra diavolo or the Boozy Broome with vodka. What’s a party without the dip? The hearty artichoke slice packs a punch with artichoke hearts, spinach, and cream sauce. If you’re not feeling like a full meal, the sicilian slice will satiate your hunger. Delicious Neapolitan pizza with a perfect thin crust. Get the salame piccante. If you’re looking for something a little more gluten-free or vegan, Two Boots has those options for you -- in addition to pizzas like the Cleopatra Jones (sweet Italian sausage, roasted peppers) and The Bird (Buffalo chicken and blue cheese dressing). For those times when you just need a solid regular dollar slice. For those times when you want a regular slice, but not just any old regular slice. 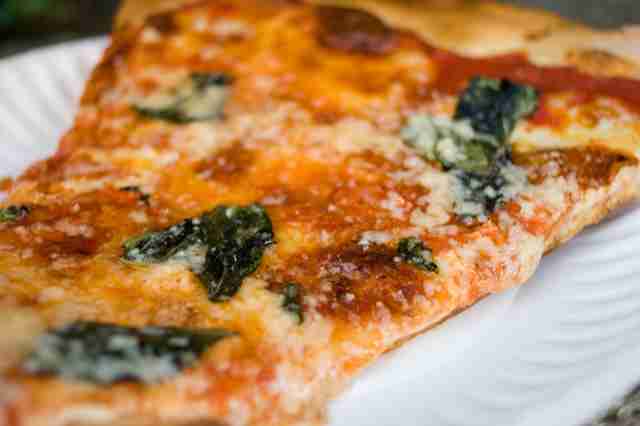 Joe’s has the prototypical NY slice, pairing thin crust with beautifully even layers of cheese and sauce. Another classic NYC slice with great crust and the perfect amount of cheese (read: a lot of it). Yes, inventive pizza is possible to eat post-2am, especially in Williamsburg. The most popular slices are the Brooklyn and grandma slices, but the pizza slingers here aren’t afraid to push a pizza with goat cheese or kale. The spit-roast pork with pineapple taco is what the restaurant is named after, and it’ll fill all your late-night authentic Mexican cravings. 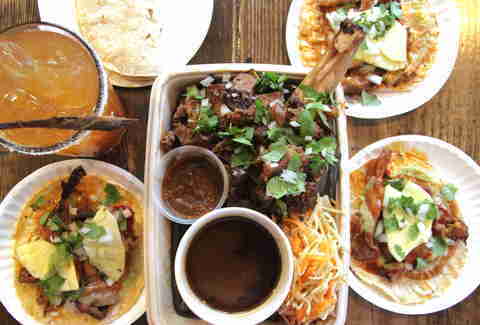 Other tacos stand up to West Coast hatred and the salsas are a secret crowd-pleaser. With the full menu of a diner -- burgers, souvlaki, and breakfast -- this spot's real heroes are found in the Mexican section of the menu. The tacos, tortas, and tamales are all delicious. One of the best burritos in NYC during the day is also a late-night all-star. You won’t be able to settle in and get comfortable at this bodega, but your stomach will think you took a red eye to California with all the flavors that’ll be coming your way. For a less authentic, yet consistently delicious experience, the Lower East Side’s Taquitoria offers a rolled taco that is then fried. You won’t be disappointed. A bar with its own taco truck and an outside chance of running into Michael Cera (one of the owners). Pick from monstrous tortas and tacos with eight different meats or veggies. Since 1954, people have been depending on Veselka’s cabbage soup as a hangover cure. 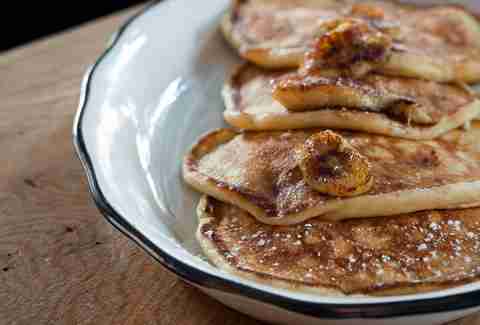 And where else can you get some of the city’s best banana pancakes alongside pierogies and a cheeseburger?! Nowhere. A fixture of the LES since 1888, this deli turns 24 hours on Friday and Saturday offering hot pastrami and corned beef sandwiches, the best of their kinds in New York. And hold on to your ticket. All-meatball everything. The optimal afterhours choice is the Smash -- two beef, chicken, pork, or veggie balls on a bun with cheese and a sauce like pesto, spicy meat, or Parmesan. Open until a whopping 6am on the weekends, Kang Ho Dong Baekjeong is one of the only Korean barbecue spots with a classically trained chef. It’s got the atmosphere of a Korean barbecue with meats the quality of a steakhouse. Slurp your way to the sunrise with the Hakata Kuro ramen that comes darkened with burned garlic in oil and crunchy mushrooms and scallions. It’s miles away from the instant ramen in your cupboard at home. If you’ve had a fancy night already, continue to Sushi Seki and you’ll be presented with one of the most satisfying (and elegant) sushi meals you’ve ever had. A Chinatown classic and great place to end your night. Anything with ginger scallion sauce and the roast duck or roast pork will make for a solid path to deliciousness. Be transported to Tokyo simply by walking down some stairs in Times Square. Seriously. This izakaya-style restaurant features a menu of delicious and cheap hits and ice-cold beers. Lee Frank is a nacho-lover from way back when. If you visit his new site or follow him on Instagram or Twitter, you might catch a reference to pro-cilantro guacamole.